In the wild, elephants travel as far as 50 miles a day and have strong social ties with their families. In zoos, they have limited space in their enclosures and sometimes have no other elephants to keep them company. Because of these unnatural living conditions, elephants in captivity can suffer from physical and mental ailments like deadly foot disease, arthritis and repetitive behaviors. And now, for apparently the first time ever, there’s another health issue to add to the list. “Our Kansas City Zoo staff faced uncharted territory recently when diagnosing one of our seven elephants with high blood pressure, or hypertension,” says the zoo’s Facebook fundraising page for Megan, a 40-year-old African elephant. Last December, a visitor alerted zoo staff that Megan had collapsed in her exhibit. After a few minutes, Megan was able to get back up on her feet. “Something significant had to be going on to put an elephant on the ground,” Dr. Kirk Suedmeyer, the zoo’s director of animal health, says in a video produced by the zoo. He suspected that it could be a heart issue. Megan’s blood pressure was checked over the next few days. It was significantly elevated, and an EKG showed abnormalities in her heart. These results and urinary tests led the zoo’s veterinarians to believe that Megan has an adrenal tumor. The tumor could be as small as a human thumbnail, Suedmeyer said, and thus very difficult to locate in an 8,000-pound elephant. He said that with current technology, there’s no surgical option available to find the tumor and remove it. Treating high blood pressure in elephants is unprecedented, Suedmeyer said. Megan is being given human medications to prevent the tumor’s secretions from reaching her heart. In order to survive, she’ll have to take the two drugs, which cost at least $6,500 a month, for the rest of her life. Suedmeyer said that Megan is much improved clinically since she began taking the medication. Since Megan is being treated with human medication, it should be pointed out that the World Health Organization recommends that people with hypertension walk and exercise regularly to help lower their blood pressure. Taking measures to reduce stress is also advised. A zoo is a stressful environment in which elephants have little room to exercise regularly. The Kansas City Zoo also features “elephant painting demonstrations” and sells the artwork to raise funds. Three years ago, one of its elephants painted sections of a piano. While this may seem cute, painting, of course, does not come naturally to elephants. Zoos consider this to be an enriching, relaxing activity, but a 2014 study of elephants painting in Australia’s Melbourne Zoo concluded that it had no positive impact on the animals’ stress levels. To further help Megan cope with hypertension, she should be moved to a sanctuary, where she can spend the rest of her life enjoying less stress, no painting demonstrations and more room to roam. If you agree, please sign and share this petition. 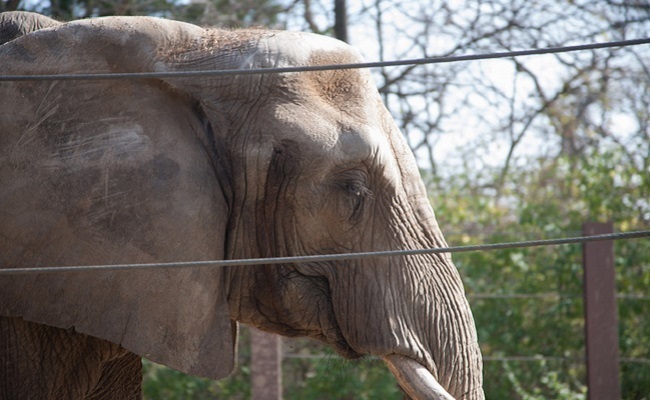 pam w. Not true, elephants are proven to be stressed and neurotic in captivity. If they can't indulge their natural instincts in wide open areas and live in social herds, they get sick.. fact. That poor poor elephant, and other animals that suffer likewise! . . . It is not surprising poor Megan has high blood pressure having been deprived of the habitat, environment and life Mother Nature intended for her! . . . Anyone with a conscience would use their money to support those doing all they can to help and protect animals, such as reputable sanctuaries, rescue centres and shelters etc. . . . NOT those such as zoos, circuses and aquariums etc., that are subjecting them to misery, depression and suffering, physically, mentally, psychologically and emotionally exploiting and profiting from them! . . . Megan desperately needs to be in a reputable sanctuary IMMEDIATELY before she develops any further health issues, where she can receive the 'genuine' help, care and respect she so desperately needs and deserves and where she can live the rest of her life in peace free from exploitation with plenty of space to roam with others of her own kind for company. Furthermore, any other elephants should be sent to the sanctuary with Megan before they develop health issues, the same for all the other poor animals confined in the zoo.